When girls come to church on Sunday with less appropriate dresses/outfits, I sometimes get “the look” or comments from other ward members, such as, “You’re the YW President, why are you LETTING her wear that?” Well, yes, I am the YW President, but the YW didn’t exactly call me to ask what she should wear that morning! It is my responsibility to make sure that each YW knows the standards, but I can’t make them wear what they should. I’m hesitant to even address an issue like that right on the spot because they are #1- at church with their parent(s), and #2- their parent(s) probably bought them the inappropriate clothes (or at least know they are wearing them). Its a tough situation, because we are supposed to support the parents, not override them. But on the other hand, if the parents aren’t enforcing the standards, it puts us in an awkward position because we are responsible for making sure that the girls know the standards and encouraging them to live those standards. I also have to consider that girls may not have the same standards at home – especially if it is a less-active or part-member family. For example, if you have one parent who is a member and one who is not (or is inactive), they may have to compromise on clothing standards as part of their family dynamic. But really- even some very active families do not always require (or enforce) the standards in their home. They may see no problem with a shorter skirt or a tank-top style dress. FTSOY gives some guidelines, but is not exactly specific in some areas. For example, short skirts are discouraged, but there is no definition of what constitutes a “short” skirt. To me, above the knee is short. To others, mid-thigh is considered perfectly fine. Our Stake dance-card standards are more specific about these sort of things, so I refer to that when girls have specific questions about clothing appropriateness. If we started having girls show up for Mutual wearing inappropriate clothes, I would probably speak to the Bishop (or the Bishopric Counselor over the youth) to see how they want me to proceed. I say that because it is a touchy subject and what is appropriate as a next step may vary depending on the girls and their family situations. Does he want you to send all girls home if they are dressed inappropriately, no matter what? Are there exceptions because of level of understanding? Does the girl not own appropriate clothing to wear? Does he want to speak to the specific girl(s) and/or her parents? Meeting with a Bishopric member would probably be my next step, because its really a tough situation…and I would anticipate some backlash from parents if there will be consequences (like sending girls home), so you will want to make sure that everyone knows the expectation ahead of time and that you have that support from the Bishopric. 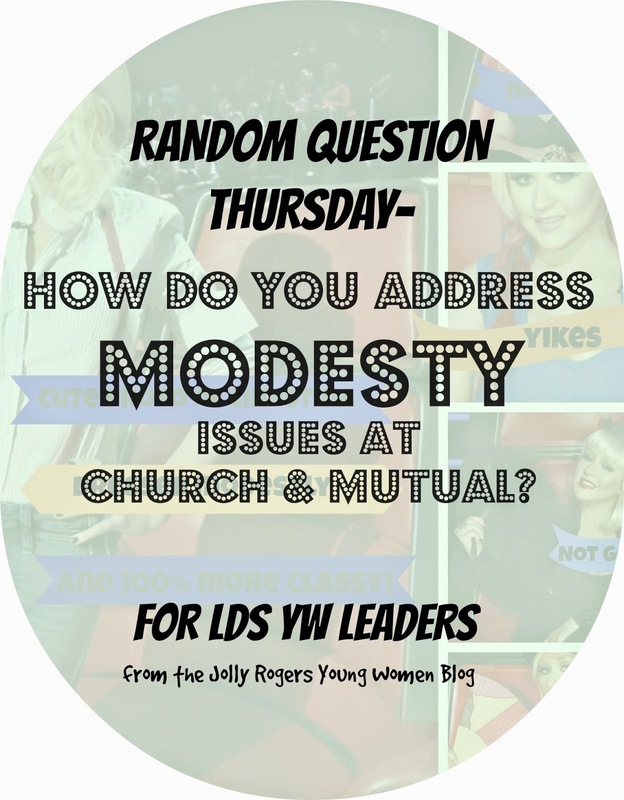 We require a certain standard of dress for stake youth dances (and other activities like EFY), and while that concept gets its share of complaints from the youth, it is understood and generally accepted. We don’t turn people away from church because they are wearing jeans instead of a dress or a sweatshirt instead of a dress shirt/tie, but at the same time, active members are generally expected to show a certain level of understanding and respect for the Sabbath. Its not that dressing more casually for something like a Stake dance would make you evil, but dressing at a higher standard shows a higher level of respect and care. You wouldn’t wear sweatpants to prom, or a bathing suit to a dinner at the White House. Sweatpants and bathing suits aren’t “bad”, but some situations and activities require a higher standard. If I ask the (active member) girls to come to Young Women in Excellence on a Wednesday night in “Sunday clothes” and one of them shows up in basketball shorts & a t-shirt, I don’t send her home, of course. But when clothes are inappropriate when it comes to modesty and a young women who does/should know what the standards are, I think thats a different ball-game. My thought is that Mutual is usually considered more like the dress expectations church – come as you are, but we prefer such and such (please). If we have a non-member or less-active girl come to Mutual in short-shorts, I wouldn’t want her to feel unwelcome, but I would want to find a way to talk to her (or the group as a whole) at some point (probably if she continues to attend after the first time) about the standards you expect in a kind and informational way. As a side-note, I joined the church when I was 18. I had the missionary discussions about the law of chastity and all that, but they (and the Gospel Essentials manual) never specifically explained about what exactly was appropriate (or not) when it came to clothing standards. I thought that not showing cleavage was dressing modestly. Nobody ever told me that there were other specific clothing standards and why. As a result, I regularly wore very short mini-skirts to the singles branch I attended for several years (and taught the Gospel Essentials class) until the youth standards were mentioned one Sunday in a R.S. lesson. At the time, I was preparing for a mission. When I found out about my own lack of modesty (although it was unintentional) I was very shocked and embarrassed. Why didn’t anybody ever tell me? Maybe everyone assumed I knew and just didn’t care? Maybe they were too embarrassed to confront me? I certainly wish somebody would have spoken up sooner! This seems like it will have to be handled on a case-by-case basis, unless your Bishop feels its best to have a general rule for everyone (you will be sent home from mutual if you are not wearing clothes that fit such and such standards). It would be nice to have the clothing standards (and really ALL standards) be a required observance at Mutual activities, since we are trying to teach and encourage those things. In general, I make sure that all of the YW and their parents are at least AWARE of what the clothing standards are. We use FTSOY as a guide (you mentioned EFY standards, but most youth in our Stake do not go to EFY and wouldn’t even know what they were! Using EFY standards might work better in many areas. We also have used dance-card standards for certain events (which in our area means boys wear collared shirts, no shorts, etc), but of course if we expect dance-card standards for an event, we have to explain what that means every time because some kids don’t have dance-cards. And dance-card standards are not all about modesty. For example, boys are asked to wear collared-shirts at our stake dances to make it more “nice casual”, but a regular t-shirt worn any other night of the month is not immodest. So, some of the dance-card standards are modesty-based and some are “dress a little nicer than normal”-based. Usually what I do when we have issues with clothing at church on Sunday is not address it while they are currently wearing the questionable clothing (since it is not usually an every week thing here). Of course, we’ve never had a YW show up in anything really extreme like a bikini, so I recognize that there may be exceptions where speaking to someone on the spot might be appropriate. Generally, I will wait and talk about the clothing standards with the entire group (such as the next Sunday during YW class). I try to work it into the lesson so that it doesn’t seem like I am singling someone out (though they will be fully aware of their own clothing habits and may feel singled out anyhow). I focus on getting them to understand WHY we should dress a certain way, not just what the rules are. Standards will just be pointless, stuffy, & restrictive laws to them if they don’t understand the reasons why. I try focus on self-respect, considering what image we want to portray about ourselves, respecting Heavenly Father, etc instead of the classic “you’re making it hard for the boys to be righteous by dressing that way”. I’ve heard some young men complain that they feel uncomfortable with being portrayed as being cavemen who can’t control themselves, so I try to avoid that. Besides, some of the girls will only hear “if I dress that way, boys will be mesmerized by me”. And really, is the point of dressing modestly to keep the boys righteous? No, it is not. It is about respecting ourselves and the standards that the Lord has set. That is why FTSOY specifies that boys and girls should dress modestly – although there are some situations where boys may not dress modestly, this happens to be more of an issue for the girls in our society. I found many pictures of Christina where (to me) she looked well, trashy. I know she’s an entertainer and she’s going for a certain look, but it is not the kind of look that makes me respect her or think of her as a businesswoman and mother. The larger photo is (to me) the one where she looks the best! You won’t get the full effect of her cleavage-showing outfits in the collage above, because I’ve covered her up with banners for my blog, but they weren’t just slightly lower necklines- these were straight-up everything-hanging-out necklines! Please don’t attack me because you like Christina Aguilara as a singer, person, whatever. This isn’t about her or her singing, this is about how she dresses. I realize that she is in entertainment and dresses to shock sometimes, but that is precisely why I chose her as an example when I was trying to talk to the Young Women about how they dress at church. They all knew who she is, and are familiar with how she presents herself. This wasn’t discussed during a “modesty” or “chastity” lesson. This whole scenario actually came up during an “Honoring the Priesthood” lesson. We were discussing ways we could honor and show respect for the priesthood. One girl mentioned that dressing appropriately (i.e., modestly) for Sacrament meeting would help keep the boys from being distracted while passing the Sacrament. I asked the girls if they knew who Christina Aguilera is. They all did. I asked them to picture one of her usual outfits in their mind. Then I asked them to imagine if she had come to Sacrament meeting that morning and sat in the congregation wearing that outfit. Would they have stared? Would they have been distracted by it? They all agreed that they would be. My point was, that attention is not necessarily positive attention and the way we portray ourselves does have an impact on others- but maybe not in the way we want. I explained that wearing something immodest or extreme (even if it is technically covering your body in a modest way – like my clown costume) is a distraction to others. You can imagine how difficult it would be to keep the Sacrament reverent in that situation, or for any of the priesthood holders to concentrate on what they were doing. I asked them if they thought the men and the boys would be able to concentrate on their Sacrament duties if Christina Aguilera were there and wearing one of those very low-cut outfits. They said they thought it would be difficult. I asked if it would be just as difficult for everyone to concentrate if I had come to Sacrament meeting dressed as a clown. They all laughed, and said that it would be. I explained that getting stared at by boys because your are wearing something distracting does not mean that you are getting positive attention. Even if a boy staring at you is attracted to you, is that the kind of attention you really want? Or do you want to be respected and admired for your personality, intelligence, spirituality, integrity, kindness, charity, etc? As I mentioned before, there are going to be girls who believe that some attention is better than no attention. Or that if they can attract boys with immodest (or bizarre) clothing, they will then start to notice their other attributes. Again, I try to focus on self-respect, treating your body as a temple, and desiring a temple marriage to a righteous priesthood holder. While being admired and found attractive by boys is important to most girls, if they really thought about it (and could choose only one) would they rather have boys like them for what body parts they are willing to show, or for their personality and other qualities?